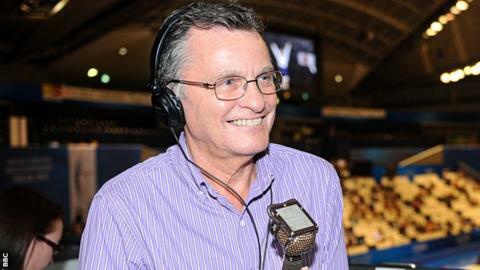 BBC gymnastics commentator Mitch Fenner has died at the age of 70. Fenner, who had been commentating on gymnastics for the BBC since 1979 - and every Olympic Games since 1984 - had been seriously ill with cancer. He acted as a consultant to the Dutch gymnastics squad from 2010 and took over as head coach two years later. Barbara Slater, director of BBC Sport, said: "He will be missed by all of us at BBC Sport and our thoughts are with his family and friends at this time." Technical director of the Dutch Gymnastic Union Hans Gootjes said: "It is a black day for gymnastics in the Netherlands, Great Britain and beyond." Fenner helped the Dutch team qualify for Rio 2016 in April, the first time the full men's team had qualified for the Olympics. But it was as a commentator that he was best known to gymnastics fans in Britain. "For many years Mitch has used his first-hand experience of working within the sport to provide our viewers with an expertise and detailed insight that was second to none," Slater added.